ArtNaturals Black Castor Oil Conditioner is specially formulated to strengthen, hydrate and help promote revitalization of dry, damaged, color-treated hair. The Conditioner’s formula helps remove excess product buildup, balances pH levels, and stimulates the scalp’s circulation, as it deeply moisturizes hair, re-texturing and smoothing. Black castor oil is noted for its ability to relieve dryness, help banish dandruff, and deeply hydrate both hair shafts and scalp. Coconut oil hydrates without leaving hair greasy, nettle extract works to lessen hair loss as it promotes shine, and thyme extract gently cleanses as it stimulates scalp circulation and healthy regrowth. Our Black Castor Oil Conditioner is also specially recommended for curly hair, as it smoothes and soothes hair that is naturally dry. This entry was posted on December 31, 2018, in Glass. Art of Sport body care is formulated from the ground up by the world’s leading skincare scientists to help athletes compete at their best. 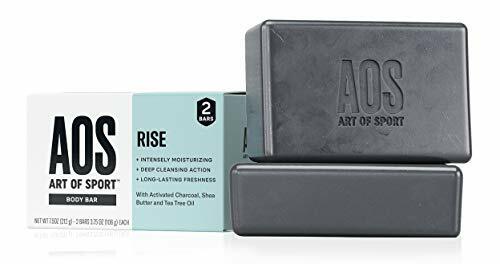 Our Body Bar soap for men is engineered with activated charcoal and moisturizing shea butter to keeps athletes’ skin recharged, clean, and all-day fresh. Delivering deep-cleansing action, hydration and long-lasting freshness, Art of Sport Body Bar is dermatologist tested, non-irritating and made only with ingredients that meet our “Athlete Approved” standard. We make our Body Bar without sulfates, parabens, alcohol, PEG, or dioxane. Comes in two invigorating scents: Compete and Rise. INTENSELY MOISTURIZING: Men’s bar soap with a rich, hydrating lather. FRESH SCENT: Rise scent is infused with cedar and vanilla. PERFORMANCE DRIVEN: Formulated to keep athletes’ skin recharged, fresh, and invigorated for peak performance with all-day freshness. FUELED BY RICH BOTANICALS: Deep-cleansing activated charcoal, moisturizing shea butter, and tea tree oil. BETTER FORMULA: Hypoallergenic, non-irritating, and dermatologist tested. Made without sulfates, parabens, alcohol, PEG, or dioxane. 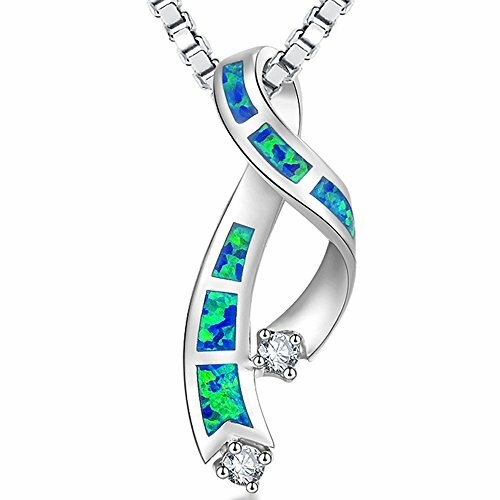 This entry was posted on December 31, 2018, in Jewelry. Now, make sure that all your delicate items are packed safely and securely in Mesha cardboard paper boxes. 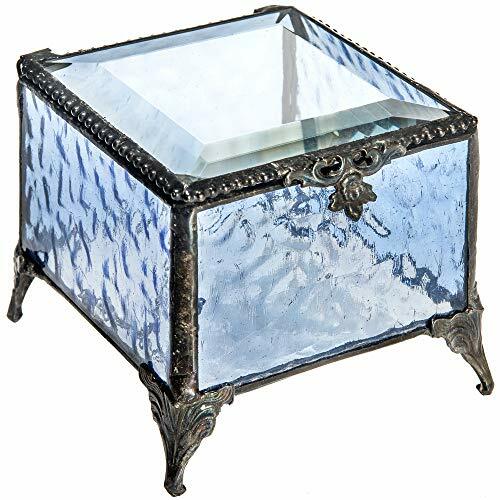 These boxes are specially constructed to keep and ship delicate items like glass, crystal, jewelry, figurines, etc.Order your supply now! EYE-CATCHING DESIGN — Pink Honeycomb Pattern combined with compact, portable design for a shining appearance. Soft cotton lining under the cardboard makes these jewelry boxes delicate and chic. Small size to be put into your handbag. Perfect for gift giving, business shipping. UPGRADE MATERIAL & WORKMANSHIP — The height currently is more higher to 1.25 Inch prior to 1 Inch. High-end surface; soft plush contton interior ensure excellent quality. 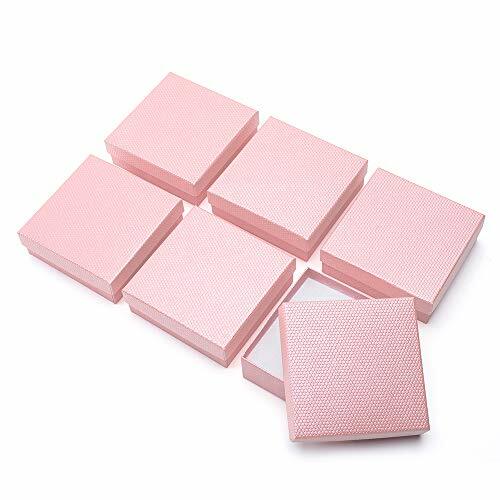 Lightly waterproof together with 100% Special craft paper for pure wood pulp offer you a upgraded unique gift experience. PROTECT YOUR JEWELS — Lightweight to carry. Moreover, the inside soft lining protect your jewelrys inside against dust, transit damage. To have it! to give the best care to your jewelry, letting it lay on the cloud! FABULOUS GIFT CHOICE — A great gift packaging for your mother, friend, wife, husband, daughter, classmates, colleague and so on. Whatever Mother’s Day, Valentine’s Day, Thanksgiving Day and other holidays, MESHA Jewelry Gift Boxes — small sized, especially designed for gift giving, is always your best choice! RECYCABLE & PRODUCT GUARANTEE — MESHA Boxes are made from 100% recycable paper and come with satisfaction guarantee. If you are not happy with the product, you may return it for a refund or exchange. Please confirm measurement before purchasing. This entry was posted on December 31, 2018, in Uncategorized. Resin handmade necklace with real blue dried flowers of Wood Forget-me-not (Myosotis sylvatica). Charming gift for a loved one, as a small reminder of your love. 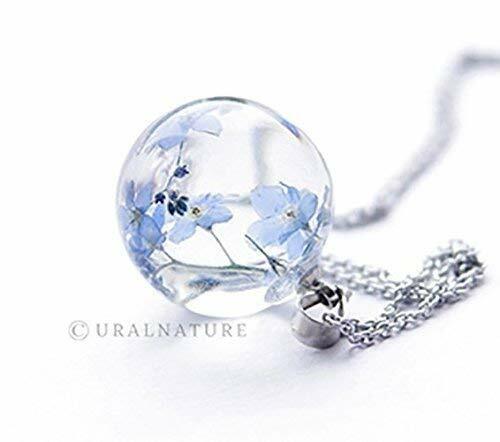 Tiny blue flowers preserved with crystal resin in shape of a ball, it looks unusual and magically. Forget-me-not flowers are transparent, the resin sphere is high quality with glossy and shiny surface, without any bubbles. Frame your photographs with elegant glass art. This table top 4″ x 6″ horizontal glass picture frame is designed using vintage inspired patterned glass and soft sage green stained glass. Glass sides and base provided added stability and uniqueness to this already exquisite glass picture frame. See additional sizes of this textured and sage green stained glass picture frame and matching home accents such as ornaments, jewelry boxes, and night lights, or shop our entire lineup of glass picture frames. All J. Devlin Glass Art is lead-free. This photo frame features a clear glass with an embossed vintage texture trimmed in sage green. This entry was posted on December 31, 2018, in Wood. 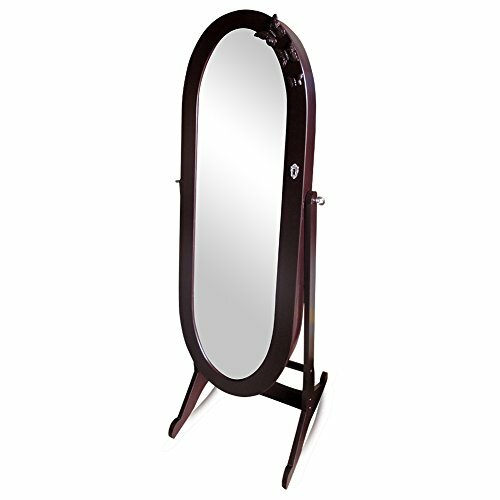 This full length mirror jewelry armoire is made of thick and sturdy MDF engineered wood with beautiful white finish. Oval shape, unique and good-looking design that will blend elegantly in with your bathroom or dressing room decor. It has a lot of space to store your jewelries and accessories, which will be the best choice for jewelry armoire storage organizer! This entry was posted on December 31, 2018, in Sculptures. 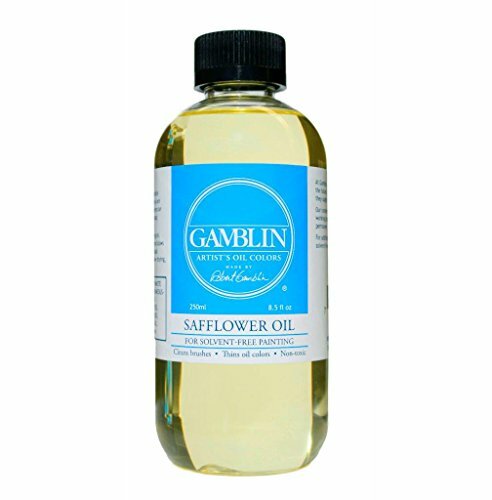 Safflower Oil is a pale, slow-drying oil. It increases flow of oil colors and slows dry time. Use sparingly or mix with an equal amount of Gamsol to create a slow-drying, low-viscosity traditional painting medium. ♥ What’s you get: pendant with 18″ necklace chain and free jewelry box, we promise it is box chain like picture ,if not,just return it. This entry was posted on December 30, 2018, in Sculptures. Made of High quality Leather,a secure stainless steel magnetic clasp serves as a focal point and provides for an easy on and off. 【White and Black Wrap Bracelet Size】: Weight: 14.6g ; Bracelet Size:20cm(7.87”)*3cm(1.18”) ; Magnetic clasp Size:1.5cm(0.59”). 【Special Design】: A secure stainless steel magnetic clasp serves as a focal point and provides for an easy on and off. 【Quality】: Metal alloy & Braided Leather Bracelet, Shin Crystal Classic and Durable. 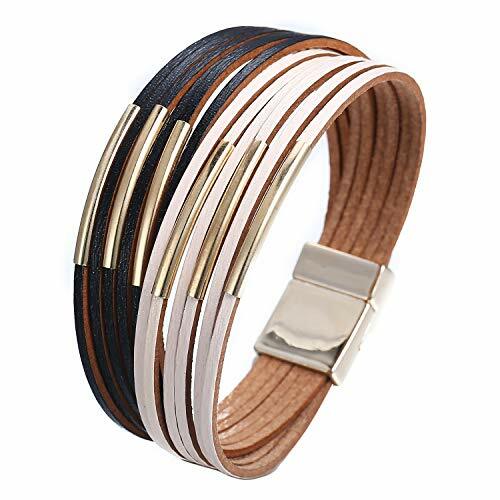 【Occasion】: Cool bracelet fit for Casual, Party, Prom, Class, Wedding, Bridal, Office.This magnetic bracelet is stylish and can be the perfect gift for a loved one or yourself. 【Return policy】: 30 day no-risk return policy. If you have any question please contact us. We will respond within 24 business hours. This entry was posted on December 30, 2018, in Wood. ♥ Necklace Materials ♥ White Gold Plated & Made with SWAROVSKI Crystals. Chain Length: 17.7″ + 2″ adjustable. ♥ Necklace Design Inspiration ♥ Inspired by Paris Fashion Week, the designer launched a brand new edition of “Heart of the Ocean” collection. Wrapped with a bowtie, the magnificent Bermuda blue crystal amazingly turn to an impressive gift. Comes in a beautiful gift box. ♥ Necklace Details ♥ Engraved with “I Love You Forever”. 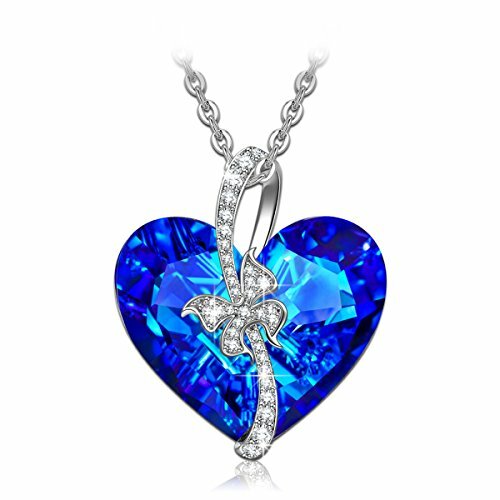 Surprising new design “I Love You Forever” engraved detailed Pendant Back adds more romantic aroma, making it the best gift to express your sincere love. Give your loved one this glistening Swarovski crystal necklace and take her breath away! ♥ Swarovski Crystal Necklace ♥ This is NOT a Swarovski product but a piece made with Authentic Swarovski Crystal. Qianse has its aspiring designers in France. We purchased Swarovski Crystals as raw material and skillfully manufactured in our independent workshops. Meanwhile, please kindly check the measurements before purchasing. ♥ Valentine’s Day Gifts for Her ♥ Comes in a fine gift box. No wrapping needed. Perfect gift for Christmas Day, Anniversary Day, Valentines Day and Birthday to your girlfriend, wife and Mother’s Day gift for mom.